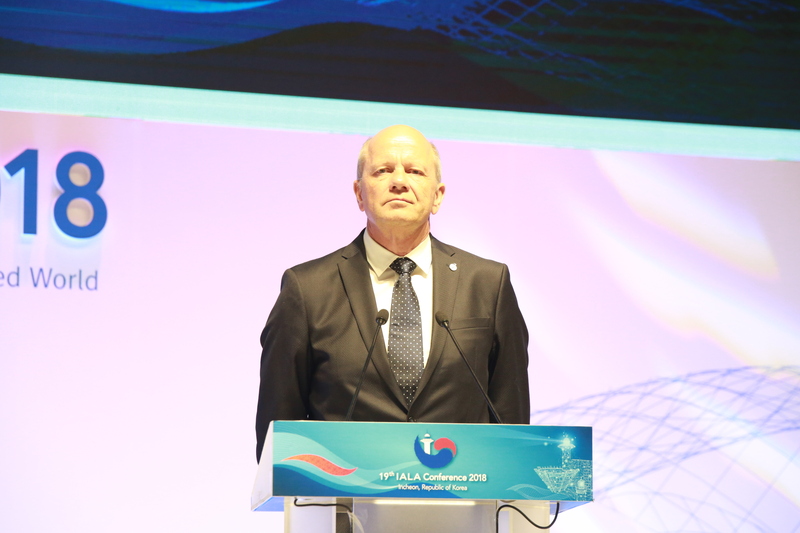 The 19th IALA Conference held at Incheon’s prestigious Songdo ConvensiA Centre from 28 May to 2 June 2018 beat all previous records, attracting over 500 participants from 65 countries spread around the globe. The large exhibition staged by the Industrial Members’ Committee also had a record number of exhibitors and was supported by a special Conference session on industry innovation. The fact that dignitaries and other special guests made time in their busy schedule to be present further underlined the importance and status of the Conference. The keen participation of conference delegates and exhibitors alike meant that open-minded exchanges of views took place on the latest developments in technology for marine aids to navigation and vessel traffic services. Relevant and difficult issues were addressed in the close to 100 technical presentations and ensuing discussions. This is what makes IALA conferences really worthwhile and why we think in terms of “the IALA family” – friendly, constructive and focused on the technical matter in hand as opposed to political interest. All that we learned during the Conference will inform IALA’s work in the coming years. We shall continue with our pragmatic approach of staying true to the needs of mariners while embracing innovation that can improve the aids to navigation and related services they want and need. In this regard, the Best Practice Competition, which was also supported by a special Conference session, remained a very welcome addition to our four-yearly gathering. The first-ever World Lighthouse Heritage Exhibition was a bold and very worthwhile project of our Korean hosts, with an extensive array of wonderful items and artefacts on display. A conference session on heritage also brought fascinating insights into initiatives for the creation of an active heritage programme in different countries. The Incheon Declaration on Lighthouses as Cultural Heritage was not only a fitting output of the Conference but will also re-energise the Heritage Forum of IALA’s Engineering and Sustainability Committee. Heritage conservation increasingly involves a social-economic dimension, providing employment in support of local communities, in addition to the preservation of historic, architectural and cultural assets for future generations. I look forward very much to working with the newly elected Council, which has three new members (Canada, Morocco and Singapore), and with our new President. Ms Young-shin KIM, Director of the Aids to Navigation Division in the Ministry of Oceans and Fisheries of the Republic of Korea, has a proven record as an outstanding Councillor and played a pivotal role in the outstanding organization of the Conference, ensuring the great success it was. The Memorandum of Understanding that IALA and Korea signed in Incheon is a great confirmation of the latter’s long-standing cooperation in the Association’s technical work concerning the harmonized provision of marine aids to navigation globally. Last but not least, the Conference fulfilled all the required tasks in accordance with the IALA Constitution.